I have no explanation for the insanity that seems to have occurred here, at what was once a desolate corner across from the Circle Line piers. 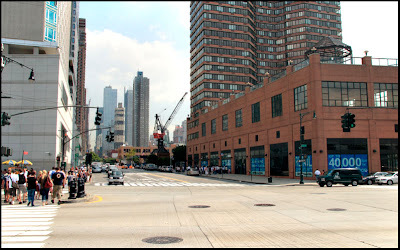 When the first picture was taken there were parking lots stretching from 11th to 12th Avenues on the south side of 42nd Street, today one immense luxury high-rise is filling up, while another fills in the hole created for it a block away. Further east along 42nd I can count at least seven buildings that weren't here in '87, as well as the obvious street improvements. 12th Avenue today is nothing like it was twenty years ago, today there are jogging and bike paths along the river, thousands of tourists coming and going to the boats, a far cry from the days when the biggest crowds were lining up for visas at the Chinese Consulate to the UN, visible in the 2007 picture on the left side of the intersection. 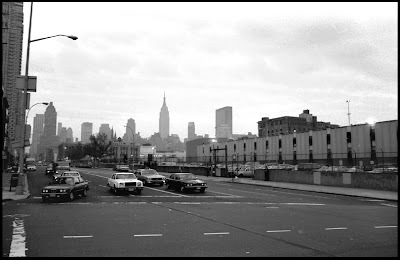 This neighborhood was about as exciting as it looked in 1987, so I can't understand the lure of the apartments here, but it seems that the new human instinct is to inhabit every square foot of Manhattan. Oh, and regardless of how long the visa lines got in the 1980's, the greatest number of people I ever saw on this corner was in June of 1989, when hundreds of Chinese filled the sidewalk in front of the parking lot on 42nd across from the consulate in silent protest and solidarity during the Tianamen Square demonstrations.